This set of machine embroidery designs is part of our Floral Foliage and Seasons collections. It uses the Freestanding Lace technique. The designs will fit the Small hoop (4" x 4"). We also used the leaves in this Thanksgiving wall quilt. This photo was sent in by Viveka Berg from Olofstrom, Sweden as her Best Project Contest 2006 entry. To read more about the project go to the customer's page. This photo was sent in by Sheila LaPierre from Las Cruces, New Mexico as her Best Project Contest 2008 entry. To read more about the project go to the customer's page. 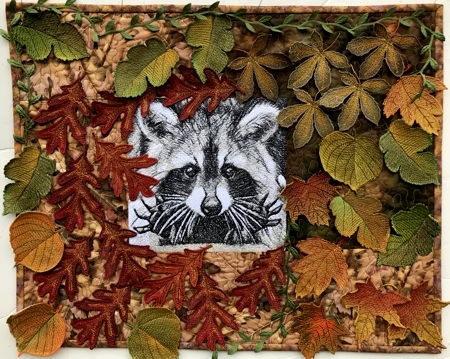 We used the leaves on this small art quilt. You can read about how to sew the quilt on the project page.